Wish someone a life of full of health, wealth, and abundance with this pewter wishbone paperweight. Wish someone a life full of health, wealth, love, prosperity and abundance with this pewter paperweight. 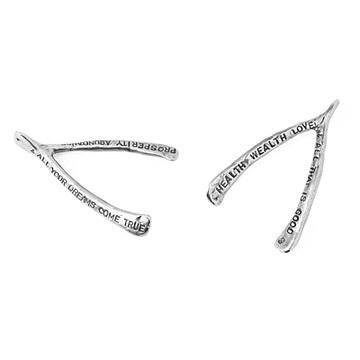 Handmade by artist Tamara Hensick, this large wishbone is engraved on each side so that you'll never run out of wishes. Handmade in Los Angeles, California. Side one: "Health Wealth Love & All That Is Good"
Side two: "Prosperity Abundance & All Your Dreams Come True"
Polish with soft jeweler's polishing cloth. Love this - beautiful design and a unique option for a gift. It is a personal reminder of a family created in our work environment; a small group of supportive, bonded, and caring individuals who work hard and rely on each other. I have mine on my nightstand and make wishes on it. Love this wishbone so much! They said they loved it. We were impressed when we got this gift in the mail. The packaging was perfect. We were looking for something a little different to celebrate a client's engagement. It was perfect. I bought this as wedding gift for co-worker. She really liked it! I've given this gift several times to do-workers who have retired. It's unique and just the right size to put on a desk top.